It's like Uber, but for fighting crushing loneliness. A new story in the Wall Street Journal looks at how senior citizens are using technology to fight loneliness — including an app, called Join Papa, that they can use to summon “on-demand grandkids” like you’d order food on Seamless or a car on Uber. Join Papa pays college-age young people $10 per hour to help seniors by shopping, doing housework, or just hanging out, according to the WSJ — but charges $17 and pockets the difference for the ersatz grandchildren. One insurer, Humana, has even experimented with a pilot program in Florida that includes ten hours of week on Join Papa near Tampa, according to the paper. 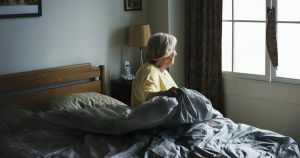 At its root, according to the WSJ, Join Pap is an effort to use to technology to fight the “ever-more lethal crisis of loneliness” among America’s seniors — who now include tens of millions of rapidly-aging Baby Boomers. For some, the app-enabled human contact is crucial. Sumkin, the 87-year-old who discussed Join Papa with the WSJ, told the paper that the Join Papa gig workers were, along with a bi-weekly stretching class, were her only human contact. Editor’s note: an earlier version of this story misspelled the insurer “Humana.” It has been updated.